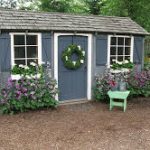 Would you like to build a “SHE SHED” for your backyard? Go to Home Re-use-ables for gently used building supplies. You will find shingles, siding, windows, doors and much, much more.